FOR SEASON OR YEAR ROUND, THIS BEAUTIFULLY MAINTAINED FARM IN THE HEART OF WELLINGTON IS OFFERED 'FULLY FURNISHED TURNKEY FOR YOU AND YOUR HORSES TO ENJOY. 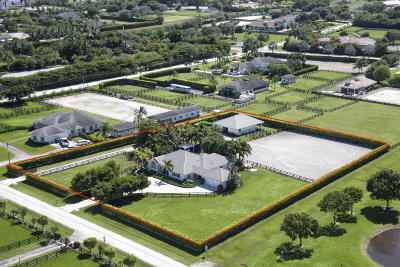 THE PROPERTY HAS A 6 STALL CENTER AISLE BARN WITH RUBBER PAVERS, 12X12 STALLS WITH WALKOUTS , FLY SPRAY SYSTEM, BATHROOM / LAUNDRY/TACK /FEED ROOM, LARGE RING WITH EXCELLENT FOOTING AND LARGE GRASS FILLED PADDOCKS THAT CAN BE DIVIDED AS DESIRED. THE HOME WITH ITS EXCELLENT LAYOUT, HAVING MASTER ON ONE SIDE AND GUEST ROOMS AND EFFICIENCY ON THE OTHER. ALONG WITH AN INVITING & PRIVATE BACK YARD WITH HEATED POOL AND PATIO, OFFERS FAMILY AND FRIENDS A TERRIFIC PLACE TO RELAX AND SPEND TIME TOGETHER. A MUST SEE!